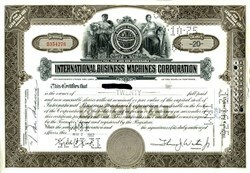 Beautifully engraved certificate from the International Business Machines Corporation issued in 1957. 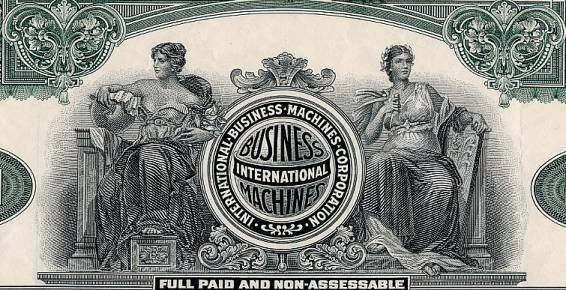 This historic document was printed by the American Banknote Company and has an ornate border around it with a vignette of two women with the business logo. This item has the signatures of the Company’s President, Thomas J. Watson, Jr. and Secretary,and is over 56 years old. The older style IBM certificate are scarce and very desirable. The name of the stock holder was blacked out which was the custom on the earlier IBM certificates.